I have a special fondness for trout. They are a beautiful jewel of a fish, found in some of nature’s most pristine and precious settings. On a mountain lake at Colorado twilight, nearly silent but for the light ripple of the lure hitting the mirrored surface of the water, anticipating, feeling for the pull, completely focused on that moment, that motion and then the strike. Fishing there with my father and my brothers, we caught a dozen rainbow trout, filleting them right at the shore. A campfire burning, with a tripod rig and a grill to hold a cast iron pan. A stick of butter, a sliced sweet onion, a couple sliced cloves of garlic, simmered slowly until golden brown and then the fresh filleted fish added. Amongst the finest things I’ve ever eaten. The setting, the company, the delicate flavor, the moment. Our memories, our emotions inevitably inform our sense of taste. For me, trout evokes both that sense of taste and the connection to place. That connection to place brings us back to the Great Lakes region, which has a number of decent trout streams, though admittedly nothing like the American West in number. Wisconsin and the Upper Peninsula of Michigan are particularly well-suited to re-establishing the brook trout. In addition, a number of local firms have scaled up the production of stream-raised trout. A recent trip to the local farmers market yielded a few unexpected delights including this lovely bit of smoked trout from Silver Moon Springs in Elton, WI, perfect for a smoked trout dip appetizer. Built on a natural trout stream in the early 1950s, Silver Moon Springs began to sell trout raised there in the late 1970s and continues now into the third-generation. Now I’ll contend that nothing beats catching a brook trout on a crystal clear stream as the sun sets into the pines and smoking it over an applewood fire, but a decent alternative is to have this lovely piece of fish prepared for you, vacuum-packed and ready to go. If you can’t make it to a farmer market where they are selling, an alternative is Rushing Waters – another fishery in Wisconsin, which sells online and ships nationally. Note: The “accent” cheese used in this recipe does matter a great deal. We have had the great fortune of using the standard Quark and the Maple Quark from Clock Shadow Creamery in Milwaukee, WI, though we have also made this with a soft goat cheese, such as a chèvre. Quark is a soft, semi-sour cheese, something like a cross between sour cream and cottage cheese. If you can find quark and your variety is quite soft, omit the cream unless needed. Personal favorite – the lovely balance of sweet and sour in the Maple Quark from Clock Shadow Creamery. Have all cheese at room temperature before beginning. Another note: Green garlic is simply the garlic bulb before it has fully matured and dried to the characteristic garlic pungency. It has more of a shallot flavor and texture but with the green onion overtones. You can find at the farmers market like we did or use fresh chives to get a similar result. Place the cheeses, garlic/chives, thyme, cream (if using), and salt into a food processor and pulse to fully combine. Flake the smoked fish apart on a plate, removing any skin or bones. Add fish to the food processor and pulse briefly to combine. For this preparation we are just mixing the trout until fully combined, no further. Some prefer to fully process the trout into a smooth paste, more of a trout mousse. A few additions to taste at this point: 1 or 2 teaspoons of lemon juice may be warranted to bring out all the flavors. Do not overdo the lemon as it tends to dampen the smoke flavors which will come more to the fore as the dip sits overnight. A drop or two of hot sauce, particularly a smoky hot sauce can add a very subtle enhancement to the dip. Store overnight and then taste test again, adding lemon, hot sauce or salt as needed. Remember that the trout is the star, so do not over-season. 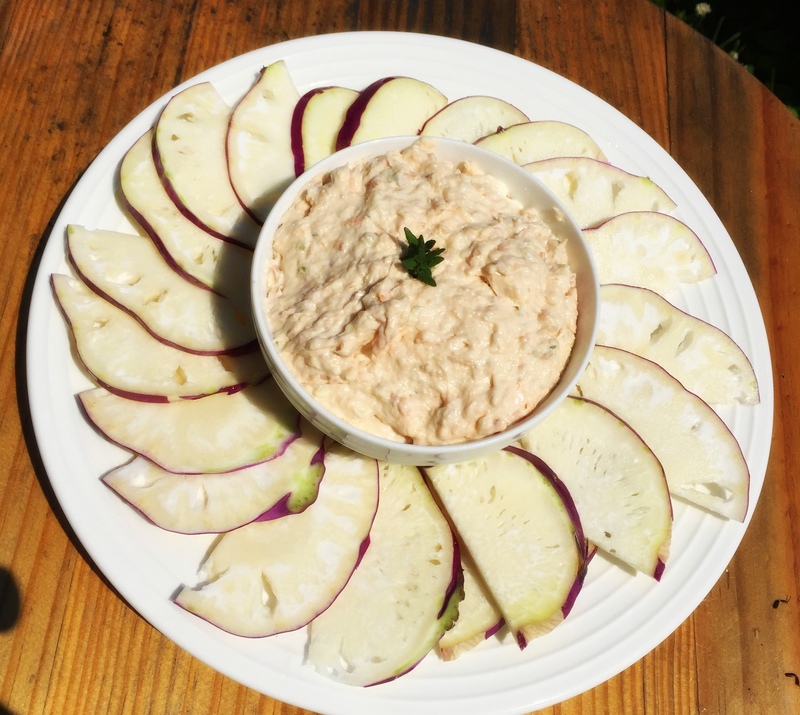 We served our dip with thinly sliced purple kohlrabi, another farmers market find. The light cabbage-like flavors and the beautiful crispness of the kohlrabi are a perfect foil for the trout dip. Cucumber is a traditional accompaniment, garden fresh would be ideal, but partially peeling the cucumber would be recommended. Alternatively, a good hearty cracker will work. We have had opportunities to make variation of this with store bought smoked lake trout and home-smoked whitefish with similar positive reviews. The quality of the fish and the “accent cheese” really make a difference as does the overnight blending of flavors. This dip ends up being more about exploration than execution, more sourcing than technique. In the end, it reflects the places the ingredients come from more than the efforts of the chef. That seems to fit well in our exploration of Great Lakes Cuisine. We’ve documented our love of Buffalo Wings in the past, not only as a unique bit of Americana but also as inspiration for our Chicken Burger. Playing around with approaches over the Fourth of July holiday recently lead to a brined, grilled variation we fell in love with. Thought we’d share. Brine: 2 cups water, bring to a rapid boil, then reduce to simmer. Add 1/2 cup sea salt, 4 bay leaves, 4 cloves garlic (smashed, skin on), 8 whole peppercorns, 1 whole dried ancho chile (seeds removed). Remove from heat and add 2 cups of ice. Resulting brine should now be near room temperature and taste like sea water (adjust salt or water accordingly). Prepare the Chicken: This can be made with traditional wings, which are the wing assembly taken apart at the joints, but we prefer to make these with boneless, skinless thighs, cut into three long strips. Place the 2 lbs prepared chicken into the brine and allow to marinate overnight. Next day, prepare a grill and heat to 400 degrees. Remove chicken thighs from brine and dry with paper towel. In a large sealable plastic bag, place 1 cup flour, 1 tablespoon paprika, 1 tablespoon garlic salt. Add chicken and shake to coat. Place chicken on grill and cook about 10 minutes per side, until golden brown. Now if you want to get fancy, throws these on a hot smoker at about 350 degrees over applewood chips for a bit longer. Remove chicken and place into oven proof pan. At this stage you can refrigerate until ready for use. Barbecue Sauce: 1 cup ketchup, 1/4 cup molasses, 1/4 cup malt vinegar, 1 Tbs. smoked paprika, 1 Tbs. ancho chile powder, 1 Tbs. cracked black pepper, combine and simmer on low for 30 minutes. Coat “wings” in sauce of choice in an oven-proof pan, and reheat at 350 degrees for 20 minutes then serve.